San Francisco Symphony (SFS) regular guest percussionist Victor Avdienko was born and raised in San Francisco and regularly attended the Holy Virgin Cathedral Russian Orthodox Church on Geary Street but, at that time, he never heard authentic Russian bells played live. Instead, he heard plenty of recordings of majestic Russian bells which always fascinated him. It was only when he visited San Anselmo’s St. Nicholas Orthodox Church in September 2012 and heard the rector, Father Stephan Meholick, play a real set of bronze church bells especially for him that he understood how special they were. After that, Avdienko championed the notion of featuring Russian bells in a SFS performance and dreamed of connecting with his Russian heritage through playing them. On Saturday evening, he’ll have his dream fulfilled when the “peal” or set of Russian bronze bells that he will play will be featured, for the first time ever, in the Symphony’s All Tchaikovsky concert at Green Music Center’s Weill Hall and Lawn. Director of Summer Concerts Edwin Outwater will be conducting SFS and Macedonian guest pianist, Simon Trpčeski, from Skopje, will play the beloved Piano Concerto No. 1. The special bells will clang for a good minute at the end of Tchaikovsky’s well-known “1812 Festal Overture,” fulfilling Tchaikovsky’s vision of bells ringing in town church towers to celebrate Russia’s victory over Napoleon. Their sound will be new and distinctive because Russian bells are polytonic (acoustical analog of polychromatic), meaning they are not tuned to any specific pitch like the orchestral bells or tubular bell chimes that we normally encounter when American orchestras perform. You can expect a rich chord of many different tones. When ARThound learned that authentic Russian bells would be played for the “1812 Overture,” I couldn’t resist investigating further. The “1812” is a thunderous Russian tune that depicts Napoleon’s retreat from Russia in 1812. That it became a popular 4th of July song in America during the height of the Cold War is a story in itself. In short—the “1812” always had a patriotic sound and was a great piece of music but it wasn’t until 1974, when the Boston Pops under Arthur Fiedler zipped it up, playing it with fireworks, real cannons and a coordinated steeple-bell choir, that it caught on like wildfire and became an American tradition. Including Russian bells is a shout-out to the “1812’s” true roots and an exciting new tradition for SFS. I first heard the mesmerizing clang of Russian bells twenty-five years ago in Sofia, Bulgaria, at the St. Nikolai Church, whose bells were gifted to Bulgaria by Tsar Nicholas II. That rousing sound is so emblazoned in my memory that it seems like I heard it yesterday. 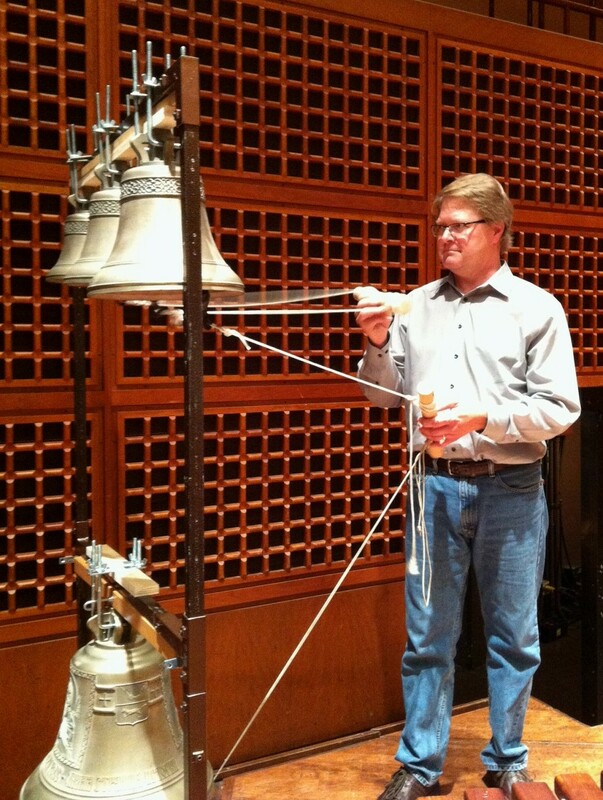 I had no idea that North America’s foremost experts on Russian bells, Mark Galperin, was just down the road in Marin and that he has been championing their resurgence. Galperin is a former physicist who immigrated to Marin in 1995. In 1998, he began collaborating with Father Stephan Meholick to build a bell collection for San Anselmo’s St. Nicholas Orthodox Church. Galperin also dutifully manages Blagovest Bells, the largest North American full service Russian bell company which has supplied over 140 churches in North America with Russian bells. He filled me in on some basics about Russian bells—history, theology, metallurgy, design and acoustics. (Detailed information can be found on the Blagovest Bells website, http://www.russianbells.com/.) Most important is that in Russian culture and history, church bells are holy and shrouded in mystery. Their clanging is said to have the power to bring people to repentance and to dissuade sin. In the Russian Orthodox faith, bells are understood as holy, “aural icons” that project the voice of God. Before church bells are hung, they are consecrated. An interesting feature of Russian bells is that they are cast for a certain strike tone and they are finished when cast—there are no post-production adjustments. That means they don’t have a “pure” (abstract or machine-made) tone, but instead they have natural harmonics that give each bell a slightly distinctive voice, which Galperin poetically compares to the song of a nightingale—each nightingale singing its own song in its own distinctive voice, no two songs exactly alike but all nightingale songs, all uniquely beautiful. From the musician’s perspective, Russian bells are not tuned and therefore do not behave like most bells that American musicians are familiar with. Galperin holds it as a good sign that the tradition of using of Russian bells in classical music has continued in America in the recent works of young composers such as the popular Russian-born American composer and pianist Lera Auerbach. She used a bell peal produced by Bloagvest Bells and recorded at the St. Nicholas Orthodox Church of San Anselmo (MP 3 below) in her well-received “Russian Requiem” (2007), co-commissioned by Musikfest Bremen, Philharmonische Gesellschaft Bremen and Semana de Musica Religiosa Cuenca. Like most stories involving Russians that I’ve reported, some wonderful connections emerged. Galperin mentioned that Blagovest Bells outfitted Victor Avdienko’s Holy Virgin Cathedral Russian Orthodox Church with a peal of 6 traditional Russian bells in 2003 and, since then, the bells are regularly rung there for Divine Services. Festal Russian Orthodox Church Bell Ringing at St. Nicholas Orthodox Church, San Anselmo. Lera Auerbach included this peal in her “Russian Requiem” (2007). Bell ringers: Fr. Stephen Meholick, Peg Golitzin, Juliana Kohl, Lea Kohl; produced by Blagovest Bells. San Francisco Symphony regular guest percussionist Victor Avdienko at Davies Symphony Hall learning the ropes, literally, of Russian bell playing. The bell clappers (the striking implement suspended within the bell) are attached to strings and are either manipulated by a hand by pulling them or by foot pedals for the larger bells. 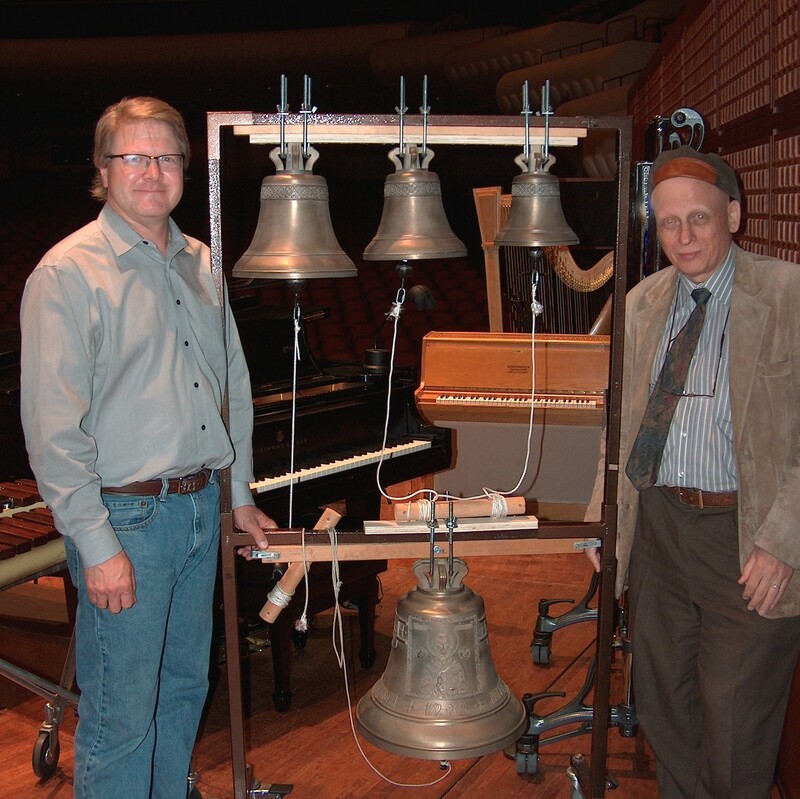 Saturday’s “All Tchaikovsky” concert at Weill Hall and lawn will mark SFS’ first use of authentic Russian bells in a performance. Image: courtesy Lisa Petrie, SFS. When did you first hear authentic Russian bells? Victor Avdienko: At the beginning of last season, we played Shostakovich’s “Symphony No. 11 in G Minor” and needed four bells for the end of the last movement, so I went on a quest for bells which were very loud, pitched, and preferably real Russian bells. I was pointed to Mark Galperin, who gave me the history and playing tradition of Russian bells. I visited San Anselmo’s St. Nicholas Orthodox Church and met Father Stephan Meholick, who played a mini concert for me on their bells. Right then and there, I knew that I had to explore this further. It felt like I was reconnecting with something deeply Russian inside me. I’ve heard a lot of carillon music from my travels in Europe and I’ve always had that in my ear defining what bell ringing should be—that they can play tunes and melodies. The Russian style is different in that they don’t play melodies or tunes; it’s more of a prayer or meditative experience to ring these bells. Because the Russian bells aren’t pitched, we didn’t use them for the Shostakovich but I kept that sound deep in me. What does it take to play these bells successfully? Victor Avdienko: Ear plugs. You’re very close and you need protection. There are some definite techniques because you’re manipulating up to a dozen bells with just your four limbs. All the bell clappers are attached to strings and are either manipulated by a hand by pulling them or by foot pedals for the larger bells. One person can make a lot of sound but there are different patterns too, actual rhythms, which you can achieve with the smaller bells by holding the strings of 3 or 4 of them in one hand. Father Stephan showed me the ropes. As a percussionist, it was not too difficult to get familiar with it but, for an average parishioner, it would take many months or even years of serious practice to properly run the patterns. Can you describe what happens for you musically in the “1812 Overture”? Victor Avdienko: The piece is very well-known for its cannon fire that everyone looks forward to. If it’s played outdoors, they’ll often use real cannons fired off in the distance. For indoor concerts it’s usually done with a recording or with a really large drum. We’ll use a synthesized cannon sound on Saturday. The bells have always been more of an afterthought that we’ve handled with chimes. The specific passage that calls for bells is in the key of E-flat. The chimes we traditionally use can be tuned just like a xylophone or glockenspiel so you can actually play an E-flat major scale and it fits the piece and sounds like a bunch of bells in the background. When you play bells that have a definite pitch to them, you have to play in the key of E-flat for it to sound good, otherwise it just sounds like you’re hitting a bunch of random pitches. Russian bells aren’t pitched a certain way, so it’s going to be more a wall of sound coming out and it won’t make any difference which bell I hit because the bell will always sound the way it should sound. What Tchaikovsky had in mind when he wrote the piece was to have all the bells in the Russian town square play at the same time to sound like a jubilant celebration of victory over Napoleon. So we are taking it back to its authentic intention. The bells occur twice—at the very end where there are cannons and full orchestra and that’s about a one minute section and there’s a section about two-thirds into the piece where we hear roughly the same Russian hymn that cellos open the piece with but, this time, the full orchestra is playing with the bells playing in the background. The mood is jubilant because this after the victory. I am looking forward to this. Mark and I have talked about this for two years now and I’m glad that the conductor was curious enough to let this happen. What will you be hitting the bells with? Victor Avdienko: I’m not sure yet. Normally, internal clappers are pulled by a string that is manipulated by a player. In the past, we’ve always used a rawhide mallet or a large acrylic beater. Mark Gaperin and I started out with about two dozen mallets. We tested about a dozen of them and settled on a special hard wood mallet engineered by a German percussion instrument design firm that very closely approximates the sound extracted by an actual bell clapper. Or, I may just go ahead and use the native forged iron clappers. It all depends on what I can get away with. We’ll either have all four bells arranged on the upper beam of a rack or they’ll be in a double tiered rack with three on top and one on the bottom. Have you ever had a Russian conduct you in the “1812”? Victor Avdienko: Most conductors just ‘play the ink’ as they say but when we get Russian conductors coming in, they will sometimes want to add some realism to the piece that most American orchestras don’t necessarily do. About ten years ago, Yuri Temirkanov (then Music Director and Chief Conductor of the Saint Petersburg Philharmonic since 1988) asked for both a Russian choir to sing a church hymn for the opening of the overture and for real bells. At that time, I didn’t know Mark or of any Russian bells in the area, so we just pulled together all the bells we could get our hands on. SFS actually owns two European-style bells that we use for Berlioz’ “Symphony Fantastique” but those are pitched very strongly in C and G for that piece, so he sat us down and gave us a lesson in what proper Russian bell ringing should sound like and for me that was the beginning of my curiosity about Russian bells. Any other special percussion effects in Saturday’s concert that you’re looking forward to? Victor Avdienko: Tchaikovsky wrote very nice percussion parts. I’ve always really identified with his cymbal crashes because they are very colorful, explosive and impactful, occurring in the right moment and emotional context. In the past, for the “1812,” I’ve always really found myself in playing those cymbal crashes correctly because you have to make the sounds of artillery fire, a celebratory crash and complete jubilation and it almost requires three personalities to pull that off. Concert Details: San Francisco Symphony’s All Tchaikovsky concert at Green Music Center’s Weill Hall and lawn is Saturday, June 26 at 8 p.m. All indoor seating is almost sold out. Lawn seating is still available at $25. Purchase tickets online here, or over the phone with the Sonoma State University Box Office at 866-955-6040. Tickets will also be available one hour prior to the performance (7 p.m.) at the Green Music Center box office. Immediately following the concert, there will be a fireworks display. Excellent Visibility: Views of the stage are amplified by giant video screens, giving everyone a “front row” experience. Snacks: A variety of food and beverages will be available for sale. Directions: Green Music Center is located at 1801 East Cotati Drive, Rohnert Park. CA. Weill Hall and the Green Music Center are located on the campus of Sonoma State University in Rohnert Park, California, at the intersection of Rohnert Park Expressway and Petaluma Hill Road. From the South, take U.S. Highway 101 north to the Rohnert Park Expressway exit. At the end of the exit ramp, turn right onto Rohnert Park Expressway. Drive 2.2 miles to the Sonoma State University entrance on your right. From the North, take U.S. Highway 101 south to the Rohnert Park Expressway exit. At the end of the exit ramp turn left onto Rohnert Park Expressway. Drive 2.2 miles to the Sonoma State University entrance on your right. Parking: Parking for this performance is complimentary. Ample parking, with excellent handicap availability, in the campus’ dedicated lot, right next to Weill Hall.